The south end of Berwyn today was originally made up of three communities: LaVergne, Upsala or "Swedetown," and Berwyn. This entire area was bounded by 31st Street, and Ogden, Lombard, and Harlem Avenues. Berwyn's development began in 1856 when Thomas Baldwin purchased 347 acres of land that he subdivided into large, 10-acre lots, hoping to market the idea that he named LaVergne as an all exclusive community for affluent residents. Baldwin invested heavily in this community; he built many roads and imported thousands of maple, ash, cedar, poplar, and pine trees, which were planted throughout the area that was bounded on the east by Ridgeland Avenue, on the west by Harlem Avenue, on the north by 31st Street, and by Old Plank Road (now Ogden Avenue and formally U.S. Route 66), on the south.At that time, the only mode of transportation between the LaVergne community and the City of Chicago was by the horse and buggy along Old Plank Road. In 1862 Baldwin sold an 80-foot wide strip of land to the Chicago, Burlington & Quincy Railroad, encouraging them to build a railroad extension to the new community. In the 1870s, residents built their own LaVergne Station along the new tracks at Ridgeland and Windsor Avenues. After Baldwin's death, his daughter Emma sold a portion of LaVergne to a land syndicate headed by Marshall Field. In 1888, as the community grew, Cicero Township, which had jurisdiction over all of the area that is present-day Berwyn, Cicero, and Oak Park, built LaVergne School on a triangle of land bounded by Ogden, 34th Street, and Gunderson Avenue. That same year, the Illinois Central laid tracks just north of LaVergne, bringing a group of Swedish immigrants who settled along 31st Street from East Avenue to Oak Park Avenue. The area, which became known as Upsala or "Swedetown," soon became well known for its excellent craftsmen and bakeries. The city now known as Berwyn had its real beginnings when two attorneys and real estate partners, Charles E. Piper and Wilbur J. Andews, purchased 106 acres from the Field syndicate for the development near the CB&Q tracks. In those early days, rail lines had a major impact on the development of suburbs in the Chicago area. Piper and Andrews asked the CB&Q to build a station at Oak Park Avenue, but the railroad refused, saying there were already stations at LaVergne and at Harlem Avenue. Undaunted, the two developers built a station themselves and the railroad agreed to stop there. With a growing subdivision and railroad station to serve it on the way, Piper and Andrews needed a name. They sought out the CB&Q's passenger agent, P.S. 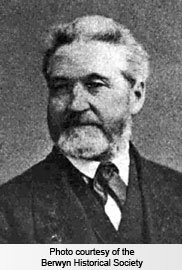 Eustis, who gave them a set of railroad timetables. After pouring through them they came across Berwyn, a small town about 18 miles west of Philadelphia. Berwyn, Pennsylvania, was a beautiful and affluent village noted for its fine gardens and scenic setting. Since this was exactly the sort of community that the two developers hoped to replicate in Illinois, Piper and Andrews decided that Berwyn was the perfect name. On May 17, 1890, the Cicero Town Board gave its approval and Berwyn, Illinois was born. Soon, a general store and office building costing about $6,000 was constructed, followed by a small post office. Homes quickly followed and gradually, eight miles of streets were macadamized and sidewalks were laid. In those early years, Piper and Andrews were actively promoting their growing community, advertising extensively in Chicago newspapers. Typical ads boasted of Berwyn's convenient location -- just 9-1/2 miles or 28 minutes by CB&Q train to Chicago's Union Depot -- while others pointed out Berwyn's many churches, splendid schools, water, sewers, electric service, and lack of saloons. Many choice lots and modern residences, the ads stated, were still available at prices ranging from $3,000 to $10,000. 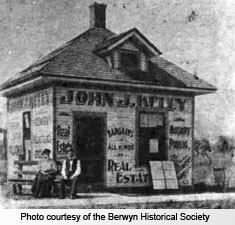 At roughly the same time, still another community wasdeveloping on the north side of present day Berwyn, aided by "Honest John" Kelly. Located more than 1-1/2 miles north of the growing communities to its south, this area extended from Roosevelt Road to 16th Street and from Ridgeland to Harlem and was first known as South Oak Park. In 1887, the Union Mutual Life Insurance Company first built homes for its employees in South Oak Park. Sold on the community's potential, Kelly opened an office on Roosevelt Road, west of Oak Park Avenue. Realtor, builder, insurance man, and community servant, Kelly was a typical turn-of-the-century entrepreneur full of energy and drive. Only two dirt roads, Oak Park and Ridgeland Avenues, connected this community with its neighbors to the south, extending across the many farms and fields that dotted the area. The street names from one side of town to the other didn't match and 1-1/2 miles of fields separated the two sections. Each community had its own churches, stores, clubs, and public transportation. Berwyn's growth was such that soon some form of local government was soon necessary and, in 1902, it was incorporated as a village. Six years later, on June 6, 1908, Berwyn became a city, receiving its official charter from the State of Illinois. The 1910 census recorded Berwyn's population as 5,841. 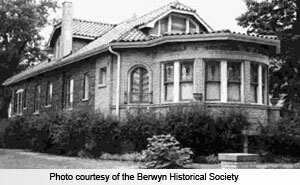 The first two decades of the twentieth century saw Berwyn develop in much the same way as other Chicago suburbs. It was a place in which, as "The WPA Guide to Illinois" states, "harried commuters relaxed in the evening, weeded gardens, set hens, and mowed their lawns." In 1921, the central portion of the city began its rapid development. Large numbers of Czechs moved from the Pilsen area on Chicago's near West Side to Berwyn and its neighbor on the east, Cicero. Literally thousands of new homes were built each year. The population growth and the infill of vacant land finally brought the two parts of Berwyn together. Many newcomers found jobs at Western Electric's huge Hawthorne Works in Cicero, commuting via trolley. On July 24, 1915, Berwyn was plunged into mourning when the steamer Eastland, chartered for a Western Electric company excursion, rolled onto its side in the Chicago River, claiming 812 lives. Many in Berwyn lost relatives, friends, or neighbors in the disaster. Berwyn's construction boom continued into the Roaring Twenties, as farms and fields gave way overnight to new homes. Entire blocks were built at once, with contractors digging all basements simultaneously, then bringing in crews to lay foundations, followed by carpenters, bricklayers and plasterers. 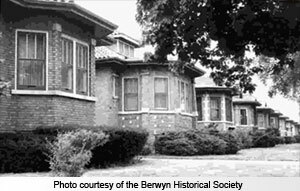 Block after block of bungalows rose as Berwyn's population swelled; from 14,150 in 1920 to 47,027 in 1930 - an increase of 222% in just ten years. Today, Berwyn has the most significant collection of Chicago-style bungalows in the nation. Traditionally, Berwyn Bungalows are one-story buildings with basement and attic, two to three bedrooms, and a living and dining room. Decorative details included oak woodwork and stained glass windows. The finances of the owner at the time they were built determined the specific design of the windows, roofs, and interiors. These bungalows, built between the 1920's through the 1940's, range in style from smaller one or one-and-a-half story units to the larger, "super" bungalows, with two full stories, glazed brick exteriors and tile roofs -- some in flashy colors like blue, blue-green or multicolor. During those years, Berwyn boasted of being the fastest growing city in the United States. Even as recently as 1991, the Chicago Sun-Times reported that "Berwyn has the highest concentration of financial institutions in the world - a tribute to the frugality of its forebears." Cermak Road, Berwyn's primary business corridor, was once known as "The Bohemian Wall Street." Families with Czech and Bohemian roots, together with many Italian-Americans, Greeks, Lithuanians, Poles, Yugoslavians and Ukrainians, have been joined in recent years by Hispanics, African and Asian Americans who now call Berwyn home. As Berwyn moves into the 21st century, its traditionally hard-working, middle-class, mostly blue collar families, who were admitted conservative in their outlook, are joined by young, professional families and a growing population of gay and lesbian residents. 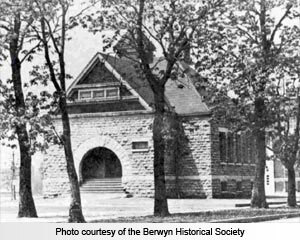 Now, just as in those early times, Berwynites are justly proud of "Beautiful Berwyn." With its tree-lined streets, sturdy brick bungalows, and Victorian "painted ladies," Berwyn continues to be a stable, safe, and diverse community. With the continuing efforts of its homeowners, business community, civic organizations, and city government, Berwyn looks forward to its "second century" as it celebrates its rich and varied past. Thielen, L. (2011). History of Berwyn. Retrieved from Berwyn Development Corporation website. * These facts are a summary of the 2010 U.S. Census Bureau.